Her eyes welled with tears as she looked into the television camera and told the world about her beautiful 10-year-old grandson, Aidan. It had been four years since she laid him to rest, after he died in two short days. In May of 2013, Sharon Pankey was touched by her grandson’s sweet request that he wanted his little pet rat, a cherished friend of 18 months, to have a family. So Sharon took Aidan to a San Diego Petco, and purchased a rat for him, whom he promptly named Alex. The family was unaware the rat had “rat bite fever,” and though Aidan was never bitten, would soon die from the bacterial infection. Two weeks after the fateful trip to Petco, Aidan fell ill with flu like symptoms. The family took him to the pediatrician, who diagnosed him with the flu. He was sent home to rest and instructed to drink plenty of liquids. The next night, Aidan’s symptoms grew so severe the family called paramedics. Aidan was taken to Rady Children’s Hospital, but it was too late to save him. Aidan died early the next morning. The San Diego County Medical Examiner’s Office conducted an autopsy and ruled the cause of death as streptobacillus moniliformis infection, or “rat bite fever.” The bacteria can be transmitted from rats to humans not only through bites or scratches, but by mere handling of a rat that carries it. Sharon would later make the heartbreaking revelation that “a shot of penicillin could have saved him” if they had only known. In 2014, Aiden’s parents sued both Petco Animal Services Inc. and Barney’s Pet Supply, the vendor who had furnished the rat to Petco, claiming they failed to test the rats for infection, sold an infected rat, and knew of the danger yet failed to warn an infection could cause death. The Pankey’s attorney, John Gomez asked for 20 million dollars in damages for the loss of Aidan. A key decision came in the case when a judge ruled the rat could be deemed a product as it was artificially created, thus invoking strict products liability law. Attorney Gomez told the media this was the first case where an animal was declared a product. The jury was tasked with determining whether there was a manufacturing defect or design defect when the rat left Barney’s and Petco, whether Petco knew or should have known of the likely danger, and whether there was negligent failure to warn of potential danger or instruct on safe handling of the rat. The Pankey’s attorneys contended there were 64 confirmed cases of rat bite fever and 200 or more individuals who had become “very, very sick” since 2001 when Petco began selling rats. 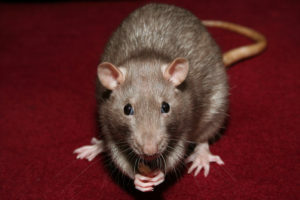 Attorney Gomez said Petco knew the rats it was selling were likely to carry rat bite fever, but buried the information on a companion animal card. Petco further knew rat bite fever could be fatal, but chose not to warn of death. On April 20, 2017, a jury found Petco and Barney’s not negligent. The jury foreman James Wigdel spoke at a press conference following the verdict. He said Petco and Barney’s “did a lot to protect.” Juror Jerome Rideaux echoed this belief by saying, “there were a lot of warnings.” A major key to the jury’s decision was indeed the waiver of liability form Sharon Pankey signed. Simply put, Rideaux said the defense had a strong case, and better evidence. Both jurors acknowledged the fact that a child died made the case much more difficult. “It was difficult to hear that, but the judge said from the beginning, ‘you have to put sympathy aside and look at the facts of the case, so that’s what we did,” explained Rideaux. Sharon said the public needs to know the rats Petco are selling do carry disease. She said 50% of the rats tested had rat bite fever. She wants Petco to provide specific warnings, including the warning of death. She said a customer can request Petco test an individual rat for rat bite fever before purchasing. Sharon wants pediatricians and other doctors to be educated to look for rat bite fever. Since many of the symptoms present as the flu, doctors need to be made aware it could be rat bite fever. Antibiotics can cure it. Sharon wants the Center for Communicable Disease (CDC) to include rat bite fever as a disease. Sharon wants more legislation to protect consumers.